Settling down with Janis Osolin for a lunch of homemade tomato soup, deer salami, bread and local cheeses, I scribble as fast as I can as he relates the history of Furk’Art . Janis is committed to people understanding the pass as more than a scenic climax, but as a site socially constructed through the conjoined histories of tourism, transportation, industrial and military usage, and also as a place where the African and European tectonic plates meet. The Alps, which each year rise anywhere from one millimeter to one centimeter a year—and are eroded almost as quickly!—are static neither geologically nor culturally. 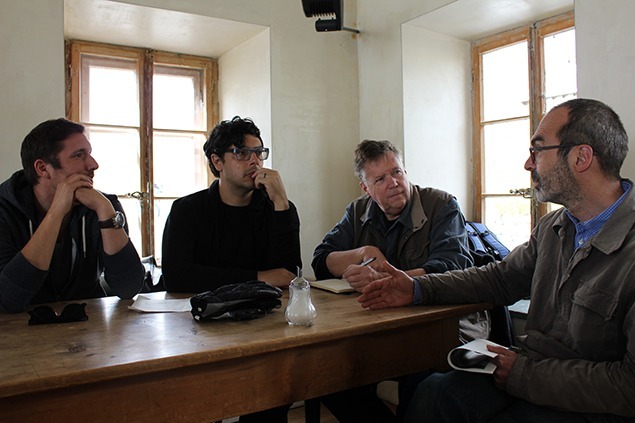 From left to right, Benîot Antille, Julian Myers-Szupinska, myself, and Janis Osolin talking in the Furka Hotel café. Photo by Sara Frantz. In his status as the caretaker of the Furk’Art program, Janis has responsibility for conservation conundrums. For example, the repainting the Buren shutters after they’ve almost weathered away requires choices about paint types, the chemical composition of which have evolved since the works were first created. 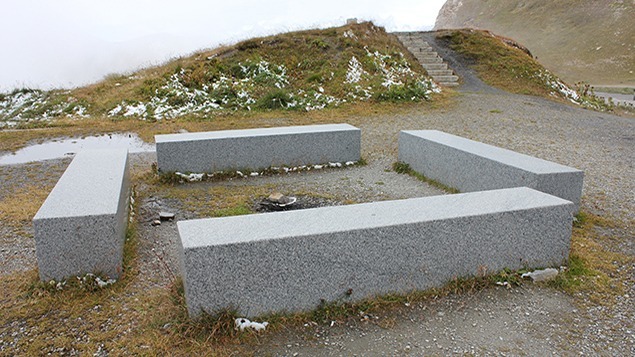 An extreme example is the set seven boulders painted with white chalk, a work that disappeared with the first snowfall. Should they be re-created? It’s clear that Janis is not in a hurry to complete his curation of the hotel contents and environs. He wants Furka to offer a “forgotten, relaxed atmosphere” in distinction from “efficient Switzerland.” To that end, and as Benoît puts it, he has stripped away as much typography from the buildings as possible in order to retain signification without signature. That, plus the ban of cameras from the premises, is akin to how land artists such as Walker De Maria and Michael Heizer demand that you experience their works in person and not through a representation. 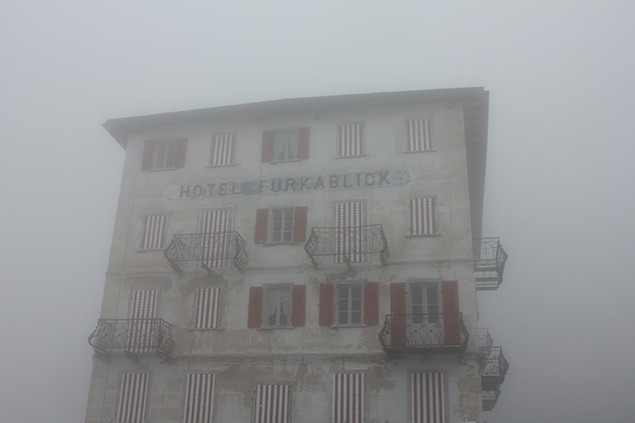 Fog closing in on the Furka Blick Hotel after lunch. The Furka Pass sits high in one of the snowiest regions of the Alps, and the pass will close in a few weeks. Photo by Sara Frantz.